Connie at Mix It Monthly has presented us with an amazing challenge this Month. It is Vintage meets Picasso, two extremes that tested by brain. She provided two images that we could work from. I decided to use her vintage lady and use an image I found on Google for my inspiration for Picasso. You know that old fairytale saying “Mirror, mirror on the wall who is the prettiest of all?” Meet my take. I am not sure who got the biggest fright! 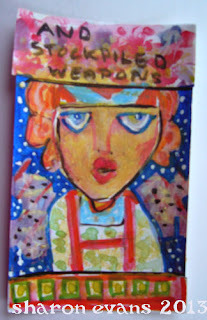 Here are the icads I completed this week. It will be my 1st year anniversary on 28 July for this blog. Paint Party Friday was my first link up and in the space of a year I have made many friends in the art blogging community and they have in turn inspired and given me confidence. So I want to say a big thank you. 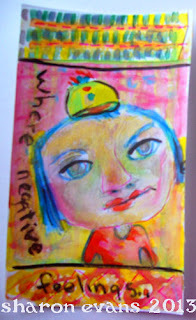 From next week I will give away 2 art postcards each week till the end of July.Also, at the end of July I will give away a 8 paged art journal to anyone who has left a comment on my PPF posts during July. I will post about the pages during the month. Anyway more details next week. I had hoped to show you the cover today, but ran out of time, as I have been battening down the hatches as we have an enormous storm waging at the moment. The South Island is under metres of snow and here the winds are a bit scary! On the news tonight, people in Wellington, the capital living opposite the beaches have had fish thrown on their lawns by a stormy sea. Make a great painting. The roads in and out of Wairarapa are closed and there are lots of power lines down. So I might not get around to you over the next day or so. If not I will try and visit as soon as things are settled. Have a great week every one. HA HA artsy fartsy...my mom used to say that all the time. Funny about the eye makeup though and I love your icads they are so quirky and make me so happy!! 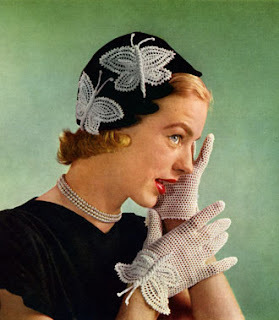 Wonderful piccaso meets vintage...love this post. Wow I can't believe you've only been blogging a year.... You've come a long way baby!! Stay safe in the bad weather!! Thanks so much, when I look back I am continually amazed at myself. I love the clever take in Pia's Mix It Monthly challenge, and the inspirational office story is hilarious! 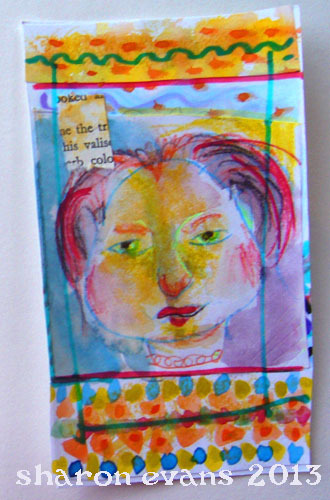 I love all your icad ladies too. Congratulations on your upcoming blog anniversary and blessings, my friend! Sharon, I especially like your index cards! I got such a laugh over your half-dressed experience. 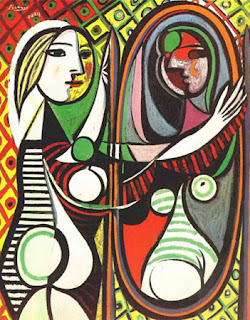 Love your vintage Picasso! And your ICADs. Sorry to hear about all than snow and here we are having summer in North America. Love your Vintage Meets Picasso! What a great combination and interpretation!! Such creativity! I love how you combined the challenge. 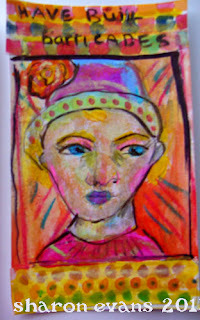 I would love a chance to win your beautiful artwork - so put my name in the hat. Congrats on your first year of blogging Sharon!!! I'm only a few months further along than you and PPF was one of my first ventures too.I have learned so much from the amazing artists out there. 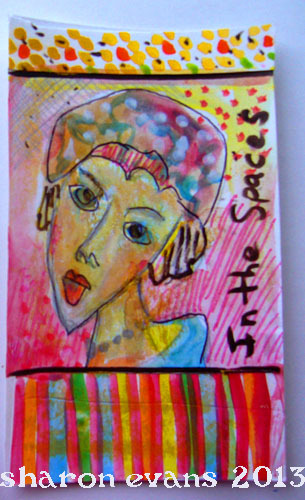 Your Picasso challenge art is SO clever-LOVE IT!!! and of course being a girl that loves color-your ICAD portraits are fabulous! Sharon you have such a great sense of humor! The image of you painting fish on grass is so whimsical, even if I feel sorry for the people in that storm, and the poor fish! I LOVE your icad pieces, all of them! 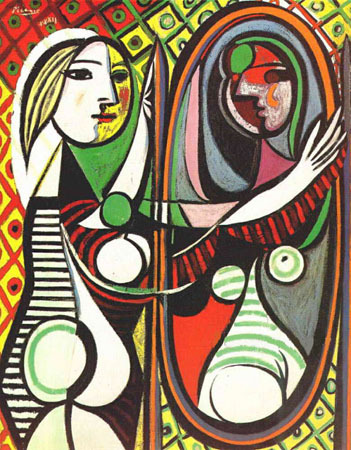 And the first image of the vintage and Picasso is fabulous, thanks for sharing it. Oh, and congrats on your 1st blog anniversary!! Hugs from California, and stay safe of the bad weather! 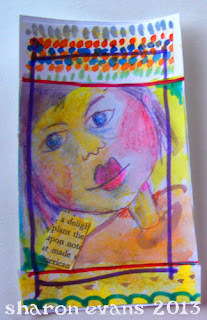 Thank you Tracey, your comments on my last lot of Icads has inspired me in another way, I have posted about it for SS. Your wish on my last post for some Queensland sun to come my way has happened, Still freezing but hey the sun makes anything possible. Your vintage meets Picasso is right on...love it!!! I lol'ed when I read about your half way makeup adventure...so funny!!! Your ICADs are great...love your style! 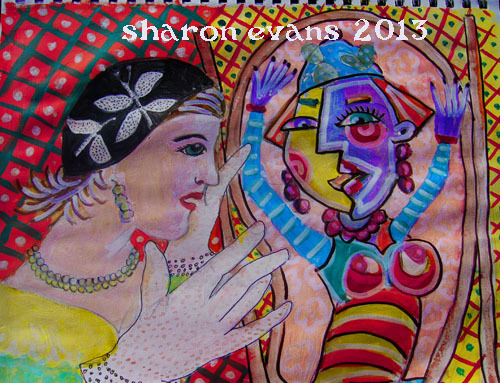 Wow Sharon, your vintage meets Picasso made my day! This is so funny and artistic and stunning! It worth more than one "wow", so here are a few more that came my way, all a little different: WOW WoW wOw wow WOw wOW Wow and woW! I also love your ICADs, they are gorgeous! Thank you so much, I am surprizing myself with these, think I have found a new track to go down. So glad I visited! Your artsy fartsy story is hilarious, and your art is wonderful and fun. Great art... I just love your index cards and your take on the Picasso challenge made me smile as did your 'make up' incident!!!! 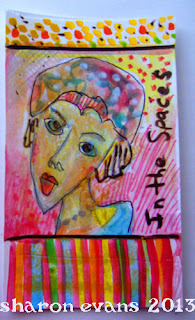 I love your Picasso inspired piece - great fun -that sounds like one cool challenge. 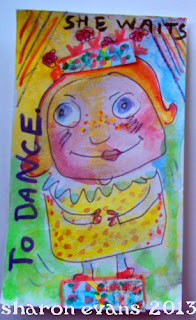 Your Icads are fab - love the faces, and the colours are so bright and cheery. great story about your make-up! lol! love your cards...great faces! I came to see your ICADs. They are fantastic, but I also liked the mirror piece, too. I can tell you love to draw. And your ICADs are just wonderfully colorful! 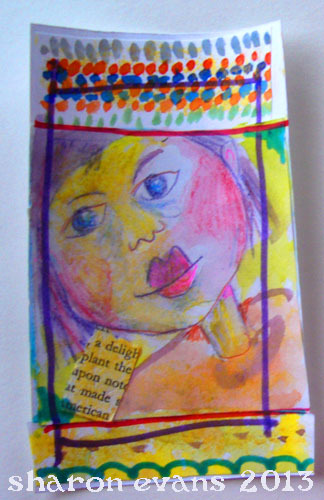 I read the post about your book illustrations, and I would say whatever you do for illustrations would be perfect for your story, and if you asked the children they would love it, I guess. Great, that you have come so far now!